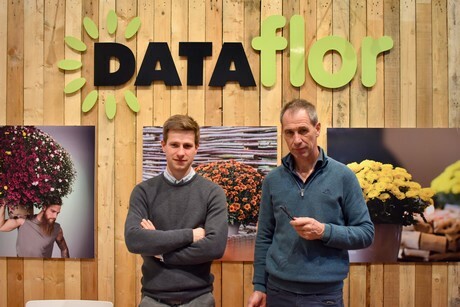 Belgian company Dataflor is probably the only grower that cultivates just chrysanthemums and strawberries together. Johan David specializes in the cultivation and breeding of bulb chrysanthemums, which started 30 years ago when he followed in his father Frans' footsteps. Frans cultivated pot chrysanthemums in combination with strawberries. The tasty fruits were the solution to the lack of demand in the winter for bulb chrysanthemums. Since greenhouses standing empty costs money, strawberries are once again being cultivated for several years now. It's not such a strange combination, considering that the strawberry plant does quite well in the winter. It doesn't require a lot of heating, and you actually have to avoid excessive temperatures if you want a compact and strong plant. Wouter, the third generation David, is also involved with the growing and the selling. Compared to five years ago, the production and marketing of strawberry plants has sky-rocketed. The product range has been considerably diversified, and some special varieties were introduced in recent years. 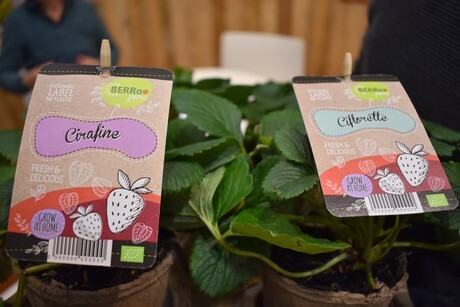 The number of plants sold has quadrupled, and the strawberry cultivation takes up 9000 m² now. The sales mainly go through garden centers. And this so-called 'better market segment' is placing more demands on products. The plant, the cultivation process, the travel route - everything must be verifiable and sustainable. Dataflor decided to meet this demand, and they presented their strategy at the fair two weeks ago. Their products are now fully ecologically and responsibly grown. "We are actually exceeding the requirements of the market," Wouter says, "and in many cases also those of the customer. We made everything sustainable in and around the plant - the jar, the labels, the packaging, the stick, etc. as much as possible. There's no need for plastic anymore. All added value, up to the ink on the label, is environmentally friendly and/or recyclable and also in the cultivation no chemicals are used. We also supply the plants in pots that the consumer can (and even should) plant in the ground because they are completely degradable." 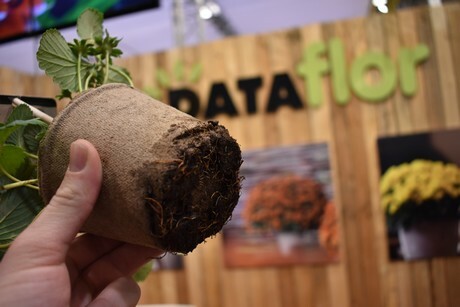 Dataflor is now relying on older varieties of strawberry plants. These are naturally more resistant to things like mildew and various root diseases. "Only with strong varieties can the cultivation resist diseases and can we guarantee that chemicals aren't necessary." "Three generations of ornamental growers have followed market changes for years and adjusted their production accordingly," they add. "The youngest generation clearly understood the need for this. Let the climate activists now prove that they are serious, Dataflor is ready!"